Police in Washington County, Oregon, have responded to a distress call from a woman claiming her home was being burgled, only to discover a robotic vacuum trapped inside the bathroom. Woman calls 911 over home invader. It was a Roomba. Of course some day, someone really will figure out how to use a robot to do a burglary. Or, more likely, subvert one via your smart home. We’ll be talking about what robots are actually coming, what they may do, and how we should prepare for it, at We Robot 2019, which starts tomorrow. Advance registration is closed, but on-site registration will be available. We have an action-packed lineup planned for We Robot 2019. The main conference is April 12-13, with an optional workshop day on April 11. I’ve put the schedule below; you should register now for We Robot 2019 if you haven’t already. We invite submissions for the 8th annual robotics law and policy conference—We Robot 2019—to be held at the University of Miami in Coral Gables, Florida, USA, on April 11-13, 2019. Previously, the conference has been held at University of Miami, University of Washington, Stanford, and Yale. 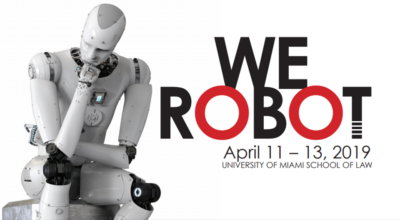 The conference web site is at http://robots.law.miami.edu/2019. We Robot 2019 seeks contributions by American and international academics, practitioners, and others, in the form of scholarly papers, technological demonstrations, or posters. We Robot fosters conversations between the people designing, building, and deploying robots and the people who design or influence the legal and social structures in which robots will operate. We particularly encourage papers that reflect interdisciplinary collaborations between developers of robotics, AI, and related technology and experts in the humanities, social science, and law and policy. This conference will build on a growing body of scholarship exploring how the increasing sophistication and autonomous decision-making capabilities of robots and their widespread deployment everywhere from the home, to hospitals, to public spaces, to the battlefield disrupts existing legal regimes or requires rethinking policy issues. Actually not odd or surprising — this is how testing of would-be autonomous works nationally, for safety and liability reasons.